My mother taught me how to make this dish when I was 11 years old and it was the first time I ever cooked with spices. 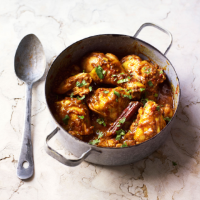 I have cooked it countless times over the years; it’s a fantastic starting point if you have never made curry and the chicken can be replaced with lamb, fish or vegetables. The way the spices are used here is the basis for innumerable dishes: simply fry whole spices to release their aroma, add onion, ginger and garlic and then add ground spices, followed by the meat of your choice and some stock. 1 Heat the oil in a large, lidded pan and, when hot, add the cloves, cardamom pods and cinnamon stick. Fry for about 3–4 minutes over a medium heat. 2 Add the onions and fry for 10–15 minutes, until golden. Add the garlic and ginger and cook for a further 2 minutes. Stir in the ground spices and cook for 2 minutes then pour in the water and cook for another 5 minutes, stirring constantly. 3 Add the blended tomatoes and cook for 10 minutes before adding the chicken pieces. Cover and cook for 5 minutes, then add the stock and cook, covered, for 10 minutes. Remove the lid, increase the heat and cook for a further 10 minutes until the chicken is cooked through and the sauce has started to thicken up. 4 Season to taste and sprinkle over the chopped coriander. Serve with steamed rice, naan bread and Cucumber Raita or Kachumber. ‘Images and text from ‘Spice - Layers of Flavour by Dhruv Baker is published by Weidenfeld & Nicolson.